Horace Langford Jr./Pahrump Valley Times Senior Grace Gundacker battles for possession during Pahrump Valley's 6-1 win over Sky Pointe on Sept. 4 in Pahrump. Horace Langford Jr./Pahrump Valley Times Pahrump Valley sophomore Madelyn Souza scored three goals during the Trojans' Sept. 4 victory over Sky Pointe. Horace Langford Jr./Pahrump Valley Times Sophomore Makayla Gent, shown here Sept. 4 against Sky Pointe, scored the first three goals Monday in Pahrump Valley's 8-0 win over SLAM Academy. Her players apparently feel the same way. 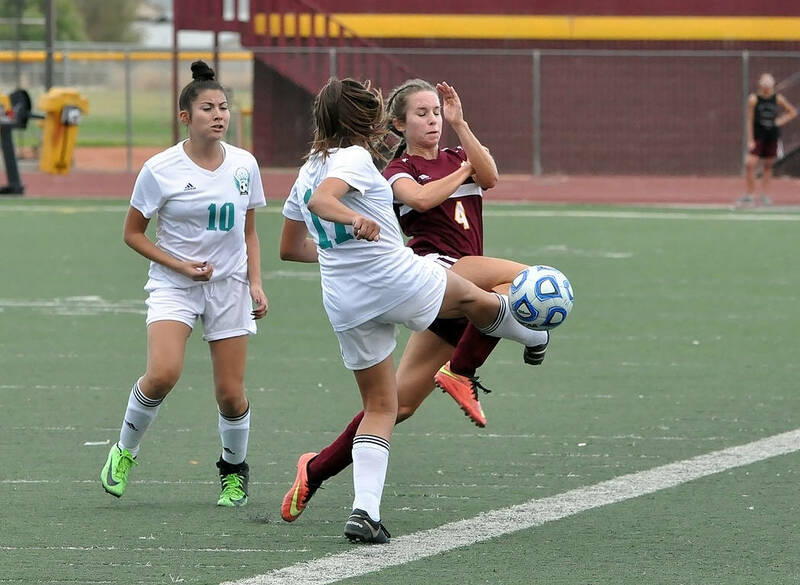 Sophomore Makayla Gent and senior Kimberly Ramos each posted a hat trick Monday as the Trojans rolled to an 8-0 home win over SLAM Academy, their fourth consecutive victory. The Trojans are playing like an experienced team, not a group that watched 52 goals, 28 assists and 13.5 shutouts walk off with diplomas last spring. Gent, who scored the game’s first three goals, and Gundacker each contributed two assists, while Stephanie Frias-Esparza had a goal and an assist. Alexis Sandoval rounded out the scoring, while Raelean Sutton made two saves. Gent’s first goal ricocheted off the far post and bounced off of the near post before finding pay dirt about seven minutes in; she turned a battle for the ball into a sudden breakaway for her second one in the 19th minute; and her third came off of a solid cross from Gundacker, who made one of her several brilliant runs to set it up less than two minutes later. The duo always seemed to be on the same page. “Those two were just on point today,” fifth-year Pahrump Valley coach Julie Carrington said. “When we tell them to go wide and they’ve got to tuck into the poles, you have to know when to do that and you have to know when your teammates are going to be going at the same time. To get that togetherness is one of my favorite parts of the whole game. Any team that has all position groups working that well together is tough to beat, and the Trojans know it. And one that has seen players step up to fill the holes left by graduation. Ramos is an excellent example of that; the senior did not score a goal last season and registered just one assist, but in addition to her Monday hat trick, she scored twice in a 9-0 win over Mojave, three in a 6-1 victory over Sky Pointe and once more in a 2-0 win over Western, a team Carrington cites as the biggest threat in the Sunset League. The Western game, in the Las Vegas Kick-Off, provided the only test of the winning streak for goalkeeper Raelean Sutton, who made 11 saves. She only needed to make two to earn the shutout against SLAM Academy, a charter school opened in 2016 by rapper Pitbull in its second year as a varsity program playing an independent schedule. The Bulls were clearly outmanned against the Trojans, which allowed Carrington to get more players into the game. And while she had high praise for pretty much everybody, she did have a few extra words about her midfield. 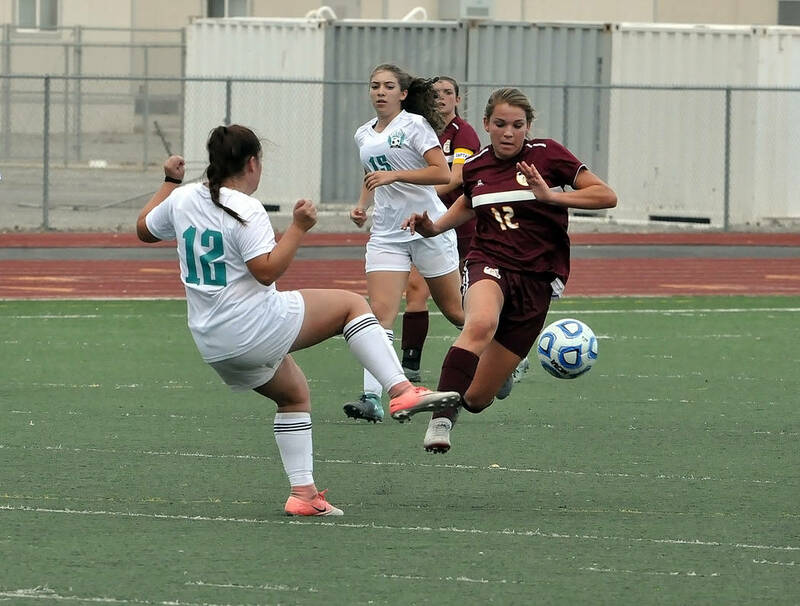 Sophomore Madelyn Souza has taken her turn as a big gun, scoring three times in the win over Sky Pointe and netting one of the two goals against Western. 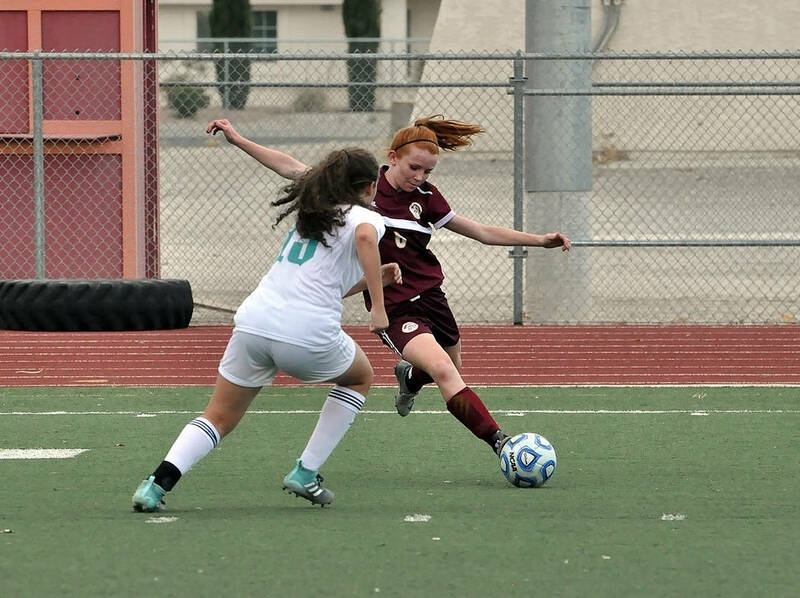 Against Mojave, Gundacker scored three times and Gent connected twice, while six Trojans added assists. There are far more difficult tests ahead, but the players who returned from a trip to the state tournament in 2017 are well aware of that, according to their coach. Gundacker believes they are well-prepared for any such tests. The Pahrump Valley Times is unveiling a new sports Twitter account. Get live updates from sporting events, photos, comments from coaches and players and links to articles covering sports in Nye County. Follow @PVTimesSports for local sports news beginning Thursday.